Just as P&O Cruises and Royal Caribbean International introduce two new ships to the UK market comes news from Germany that it has finally surpassed the UK in terms of the number of ocean cruisers it produced in 2014. With Aida and TUI both in the course of introducing new tonnage, Germany will have introduced five large new ships (with 14,000 berths) by the end of next year compared to the two (with 7,827 berths) that are now being introduced in the UK. Meanwhile, a new merged Lindblad Expeditions will float in the US later this year, with the news breaking at the same time of plans to order at least two new expedition ships for delivery in 2017 and 2018. Just as P&O Cruises introduces the 3,647-berth Britannia as its “ship for Britain” and Royal Caribbean International gets ready to introduce its even larger 4,180-berth Anthem of the Seas to the UK market, comes news that even greater advances are being made in Germany, where the cruise market appears to have surpassed that of the UK for the first time in 2014. At the ITB event held in Berlin earlier this month, CLIA Germany revealed that 1.77 million German passengers took an ocean cruise in 2014, which compared to 1.7 million who had cruised from the UK in 2013. CLIA UK said its 2014 figures would be released at Cruise Shipping Miami this week. 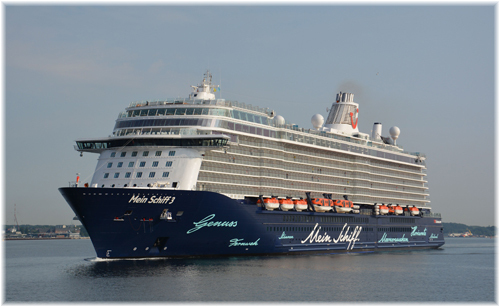 Experts now expect the German cruise market (with a population of 81 million) will permanently outstrip that of the UK (64 million), with as many as 2 million Germans taking ocean cruises in 2015 and 3 million by 2020. Unless China develops its numbers quickly, Germany looks to become the largest cruise market in the world outside the United States for the foreseeable future. While Carnival UK has now introduced a single ship for P&O, its first in five years, its German associate Aida Cruises has built a new ship every year between 2007 and 2013, and is now in the course of introducing two 3,250-berth ships of a totally new design. All Aida ships have been purpose-built since the first 1,180-berth Aida was built in 1996. The new Aida Prima will enter service this September and her as yet unnamed sister ship six months later. In a departure for the industry, both are being built in Japan as opposed to in a European shipyard, although Mitsubishi Heavy Industries, which also built the 2,702-berth Diamond Princess and Sapphire Princess, has now said it will build no more cruise ships because of the heavy losses it is sustaining on building the two Aida ships. 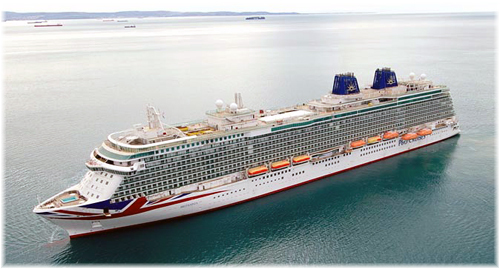 And while P&O has acquired one former Princess ship (the 1,950-berth Oceana, ex-Ocean Princess) and built its last three ships to Princess designs – the Britannia is a development of the three ships of the “Royal Princess” class – it has not built a ship to its own design since the 1,868-berth Aurora fifteen years ago. Meanwhile, on the Royal Caribbean side, that group’s half-owned German affiliate TUI Cruises took delivery last year of its own first newbuilding, the 2,500-berth Mein Schiff 3, with another ship to follow every year until 2017, and possibly longer. Together with the newest Aida pair, this will bring five large new ships with 14,000 berths into the German market by the end of next year, with more to follow. In 2011, the UK cruise market counted 1,701 million passengers, but was up only 0.1% in 2012, and rose to 1,726 million in 2013, a feeble rise of 1.5%. In Germany, the cruise market has tripled in ten years while in the UK it has recently been stagnating. 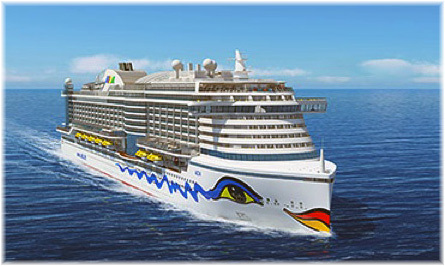 In addition to the new ships for Aida and TUI cruises, Germany has brought us a great success in the 516-berth Europa 2, but its smaller cruise lines have been suffering, with three having gone out of business in the past year alone, the last being Deilmann and its 552-berth Deutschland, which at last word was still seeking a buyer. It appears that the big new ships are attracting demand away from the older smaller ones, which are slowly disappearing. Lindblad Expeditions and Capitol Acquisition Corp II last week announced a plan to merge to create Lindblad Expeditions Holdings Inc. Lindblad Expeditions Holdings will be a publicly traded company listed on the NASDAQ and led by Lindblad president and founder Sven-Olof Lindblad along with the current Lindblad management team. Capitol Acquisition Corp II is a public investment vehicle formed for the purpose of effecting a merger, acquisition or similar business combination. The transaction is valued at approximately $439 million. After the transaction, Capitol will own 50% of the company, Lindblad will own 49% and a foundation affiliated with Lindblad will own 1%. Terms call for the current owners of Lindblad to receive a $90 million cash payment on closing. Founder and president Sven-Olof Lindblad will retain 29% ownership in the merged company. According to a recent adventure tourism market study conducted by George Washington University and the Adventure Travel Trade Association, adventure travel grew by 65% annually from 2009 to 2012. Meanwhile, according to the CLIA Cruise Industry Outlook for 2015, specialty cruises grew by roughly 21% annually from 2009 to 2014 and that market is expected to continue to experience double-digit growth. 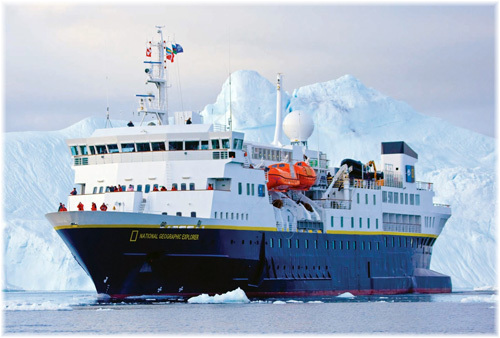 Shortly after this announcement came news that Lindblad was looking to order at least two newbuildings for its fleet, which presently consists of six expedition ships, the largest being the 148-berth National Geographic Explorer and 109-berth National Geographic Orion, which was acquired along with Orion Expeditions and moved to other waters. The newbuildings, which would be roughly similar in size and style to the company’s existing ships, would be ordered for delivery in 2017 and 2018. 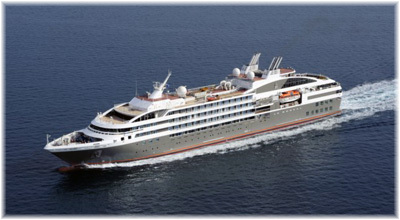 The last set of purpose-built expedition ships to be built was Ponant’s somewhat larger quartet of Le Boréal, L’Austral, Le Soléal and Le Lyrial, each capable of carrying up to 246 passengers, and often used on charter by firms such as Abercrombie & Kent, Tauck Tours and possibly soon by Ponant’s latest acquisition, Travel Dynamics International. SunStone Ships of Miami have also been seeking charterers or operators for a new design of expedition ship called “Project Unlimited,” Ice Class vessels that will be able to accommodate between 120 and 240 passengers, depending which design is chosen. It is understood that talks have reached an advanced stage with a European shipyard to produce such vessels.